Fresh frozen royal jelly in 16 oz. (1 lb.) bag. Please see shipping requirement below! You will have to select either UPS ground or UPS 2 day air as your shipment choice when you are checking out depending where you live - scroll down page to see shipping info. 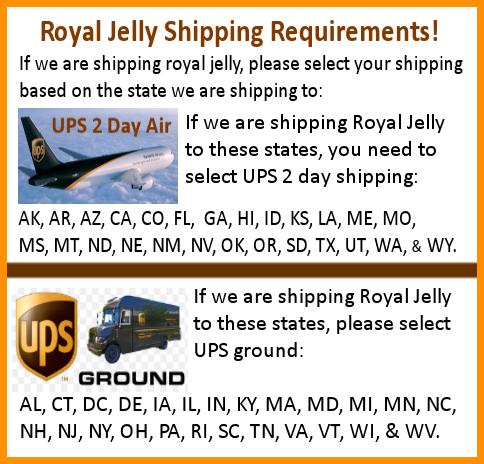 Please note that we ship royal jelly out on Mondays and Tuesdays just in case there is any type of delay so it does not sit over the weekend on some UPS truck. Fresh frozen royal jelly in a 16 oz. bag - 1 pound. Please note shipping below so your order is not delayed! The royal jelly with be shipped within a cooler. 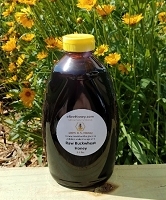 When you receive your royal jelly place it in your refrigerator or freezer. Royal jelly will be good for 1 year in the refrigerator or 2 years in the freezer. If you get a large amount of royal jelly, we suggest placing a smaller amount in the refrigerator and the rest in the freezer. Royal Jelly Shipping: Royal Jelly needs to be shipped so it's delivered within 2 days of us shipping it. We ship royal jelly frozen with an ice pack and in a cooler so there is no chance that in 48 hrs it can spoil. There is simply not enough time between when it left here frozen, having to thaw and arrive for any spoilage to occur. We do not expect the royal jelly to be frozen when it arrives to you. Extended times at room temperature or higher does slowly decrease the beneficial properties of royal jelly, but certainly nothing noticeable in 48 hrs. Royal jelly is fed to the queen and larvae at about 93 F, and may remain there for over 24 hours before being consumed. Royal Jelly by it's very nature is very tart tasting. I hope this gives me some energy and helps me to feel good enough to take my dogs for walks and to ride my horse. My breakfast consists of a piece of toast, covered with coconut oil, cinnamon, raw honey and royal jelly. I have severe health problems. I am not expecting miracles...just hoping for a bit of energy. Great product. Fast shipping. I will be ordering this again. Fresh Royal Jelly from eBee has been a real game changer for me. I am healing from Late Stage Lyme, and this RJ has helped me in multiple ways. If I spell 'em out, the FDA may jump on my head for making claims, so just take my word for it. 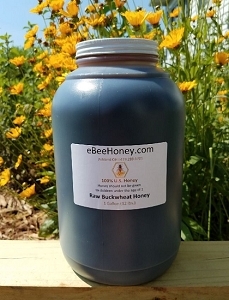 I am healing, and a huge part of that is the Royal Jelly from eBeehoney. Yes, yes, yes. The shipping is high. It is worth it. Every order has arrived packed in its own little cooler with an ice pack to keep it cool, fresh, and potent. eBeehoney pays a lot of attention to detail, and it shows. Why? Because they are protecting the potency of this very powerful substance. Don't think you will get the same benefit buying Royal jelly in capsules off the shelf. This stuff is the real deal and worth every single cent! Thank you, Glenn and Becky! eBeeHoney Response: Jose, please note the royal jelly will not lose any properties per se in such a short amount of time. It leaves here frozen with an ice pack and we always ship royal jelly orders out late in the day as well. If you think about a beehive - they are 95 degrees year round. 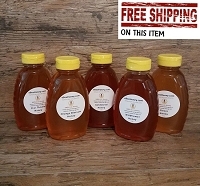 We are not worried about the properties of royal jelly since none will be lost as you mentioned above within 48 hours of the shipment time even if the royal jelly is not frozen when it arrives. We worry more about spoilage and that is why we state 2 days as the shipment requirement. We have some customers who never even refrigerate their royal jelly but we do not recommend this at all. We also have quite a few customers who stock up on the royal jelly during the winter months when it is 90-100 degrees outside. Take care. Great prouduct, lots of benfites . Great product, arrived cold after sitting in the UPS truck from 5AM (out for delivery time) until 6PM (delivery time) on an 80 degree sunny day. Will order again and purchase the 2 pound package. I ordered Royal Jelly 1 pound Monday morning. In Friday morning, the UPS 2 day Tracking said it left for a delivery before 6AM but it was delivered after 5pm when the building was closed and I gave up on getting the Royal Jelly. The package was left in the UPS truck the whole day in a summer day, which meant a very warm royal jelly. I felt it was no good and I did not want to risk it so I threw it away. Shipping was fast but still arrived with ice pack melted and warm, Royal Jelly was very warm. It is summer here in the South so maybe we should have ordered in the fall. We froze it as soon as it arrived so maybe everything is still ok! No fault of the seller, just summer! l received the package with ice pack already melted. The Royal Jelly color was yellow not off white or semi-yellow. So, l don't know if the jelly lost it's power? l did take it in the morning on empty stomach like 1/2 tsp. and l felt that l have a little more energy. It did not cure or improved my condition. Customer service is superb. Minutes after completing my order, I received an email from Becky confirming my order and shipment. I ordered on Wednesday and got my royal jelly Friday. The royal jelly comes well packaged with an ice pack. I am happy so far with the product. Thank you! 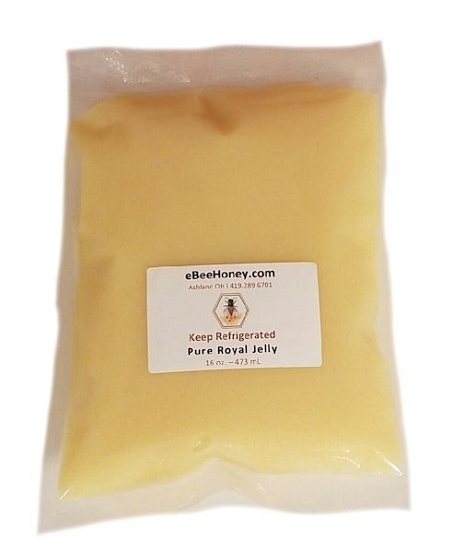 I ordered this 1lb size royal jelly to try and help with my overall health and energy. When I opened the package 1lb seemed like much less than I expected, but 1lb is 1lb (refer to the question, what weighs more 1lb of feathers or 1lb of rocks?)! I have been taking 1tsp every morning with raw goldenrod honey, and I can say that I do seem to be more alert and have more energy. I will be ordering more when I get low on this, only I will be ordering a larger amount so I can keep it on hand. still frozen when it was delivered. Looks good. Royal jelly is a great product. Very satisfied with the purchase. Definitely going to recommend this product to others and will order more. Royal Jelly is really awesome product. I definitely will buy more. 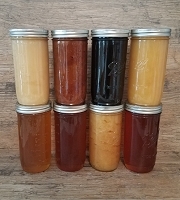 I have been using the eBeeHoney for the past two weeks. I'm waiting for results, but I feel the difference already in terms of my energy! I been recommending it to my friends. Definitely a returning customer. Thank you! Everything is great, good quality product and good services, I will be back to phurchase next time. 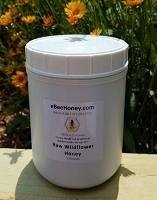 I've been purchasing my Royal Jelly from eBeehoney for almost 3 years. Never disappointed! My husband even takes it! Definitely a superfood I cannot go without! If your looking for a great way to optimize your health you found a great product in ebee royal honey. I've been taking ebee Royal honey for over 2 months now and I feel great, I play hockey and usually the next day suffer from some joint irritation or stiffness, Royal jelly has helped ( along with clean living) to eliviate these symptoms. Don't be mislead about the other Royal jelly products out there, ebee has the purest form out there. Thank you ebee. My husband has some serious health issues due to an infection on his spine after a routine surgery. He is left with weakness and severe pain and fatigue. We researched Royal Jelly and also found that not all Royal Jelly is the same. 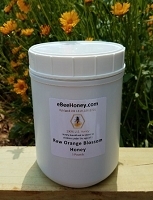 EBeeHoney has helped my husband with his fatigue and just making him feel generally better! Great customer service and shipping of the product is done so that you receive your item fresh and as described! 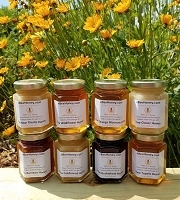 We're very happy with EBeeHoney and the quality of their Royal Jelly. They take great care to insure that this product is shipped fresh and fast. Great customer service and communication and the product is fresh (and potent!). great product, the shipping came on time in a solid form container with ice gel pack. Royal Jelly did not taste as bad as I remember, it is actutually sweet in you sweet first, then the sour milk taste keep in with a little kick at the end. I will recommend to my friends and families. I read that Royal Jelly was a known testosterone booster so I have given it a try and I have noticed an immediate difference. I can tell you. It works! I bought 2 small bottles of fresh organic royal jelly in France and I wanted to get more in USA but I did not find it. I recently searched online and i found your website. I had dark spots on my face and after 3 weeks of daily use in the morning, they disappeared. Thank you for your product. I recommended my friends to ebeehoney and they already ordered your stuffs. This is excellent product and price works for my queen rearing operation. I ordered one pound fresh royal jelly. It arrived within 2 days and packed with icy bags. Delivery fast and arrived well. I took it for one week already and; the quality is really good. I will continue buy from this store and recommend it to my friends. Ordered for the first time. Packing is good but it's not cool anymore when I opened. I don't like the taste but as long as it good for health so why not. Only a tea spoon every morning. Very happy with the high quality royal jelly. Also, recommend taking it with honey as it is potent. I will definitely buy from eBee again! I got my order as promised, very well packed. The Royal Jelly is fresh and I am very happy with my order. It's the first time I'm taking and I hope it helps to nourish my nervous and immune system. After my first 10 days of taking Royal Jelly I can say that my skin is wonderful as never been before. Ordered Royal Jelly for the first time. Arrived safe cold and happy in a little cooler. As instructed, put some in freezer and keep small jar in the fridge. I started to take Royal Jelly every morning, 1/4 of a tsp under tongue. I hope it will help my overall health. Taste is awkward, but no problem to taking it if you treat it as a medicine, not as honey. 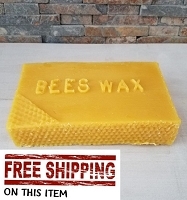 The price at Ebeehoney is the best I found for this product. 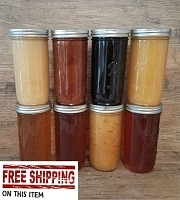 Dear eBeeHoney, I got my order as promised and the Royal Jelly tastes really good. It is fresh and I am very happy with my order. I am waiting to see the result from taking it daily and will refer to friends. It's really pure and good quality, love it and has been a loyal customer. Only issue is how to keep the bag cool for 3 days delivery process. When the bag arrived it's not that cool anymore, but I really like the product and service I received. Packing is good. My order got here safe and sound. excellent email communications, fast, friendly and customer oriented. The royal jelly is great. Tastes just like what I remember how it should be. Will order again. It does not get any better than this, folks! I eat a teaspoon a day to nourish the brain and nervous system. Very good. They delivered the jelly in very good shape and fast ship. We've been taking it since the past winter. As far as I searched the internet, so far, this is the best website to buy royal jelly. The Ebeehoney royal jelly is so far the best of its kind I have taken. I've been using royal jelly from other brand for about 2 years, and I can confidently say that Ebeehoney royal jelly is much better; the aroma, taste and color. Hi, I always buy royal jelly from EbeeHoney.com and very happy with the purchases.